New Delhi: Ganesh Chaturthi, a 10-day festival which marks the birth of Lord Ganesha has commenced. The festival that celebrates Lord Ganesha as the God of new beginnings, the remover of obstacles and the God of wisdom and intelligence, is celebrated with great pomp and show across India. From bringing home the colourful Ganapati idol, decorating him with garlands and metal jewellery to finally immersing the elephant-headed God in river, the 10-day celebration is rejoiced by everyone, except the water bodies, as immersion of the idols pollutes them and results in river, lakes and ponds be in a pitiable state post celebrations. Ganapati idols which are usually made of Plaster of Paris (POP), plastic, cement and coated with toxic paints take several years to fully dissolve in water. Also, it reduces oxygen levels in the water, killing fishes and other aquatic animals. Asking people to not harm the environment and marine life by using plastic this Ganesh Chaturthi, Padma Award winning sand artist Sudarsan Pattnaik, created a 20 feet long sand sculpture at Odisha’s Puri beach. 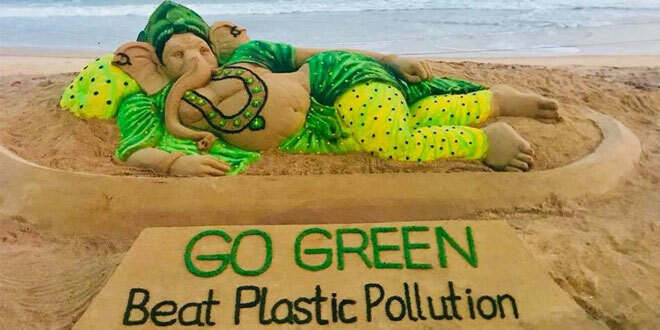 The green and yellow sand art of Lord Ganesha was accompanied with the message – ‘Go green, beat plastic pollution’. While addressing the nation on the 46th edition of Mann ki Baat, a monthly radio programme, Prime Minister Narendra Modi, appealed for an eco-friendly Ganesh Chaturthi. “Right from the Ganesh idol to all decorative material, everything ought to be eco-friendly and I will appreciate that separate competitions be organised in each city. Prizes too should be awarded for these, and I will like eco-friendly items related to Ganesh Utsav are displayed for wider publicity on My Gov and Narendra Modi App,” Prime Minister Modi said. This is not the first time Sudarsan Pattnaik has created a sand art with a message to beat plastic pollution. This year on the occasion of World Environment Day on June 5, the internationally-acclaimed sand artist created a sand turtle art measuring 50 feet long and 30 feet wide, using plastic bottles for the installation. Before Independence Day on August 15, Mr Pattnaik asked people to not use plastic flags and save the earth from plastic pollution. On other occasions like World Oceans Day, Earth Day and Turtle Day, the artist had asked people to #BeatPlasticPollution through his captivating and magical work of sand art.